Applying heat and ice to our aches & pains is one of the simplest ways to help control discomfort. But, which one should you use!? This question is frequently asked of healthcare practitioners. Luckily, for the most part, the answer is simple and straight forward. HEAT---think about that long-standing body ache, tension point, or stress induced tightness. These are the types of symptoms and conditions you should heat. Applying heat will sooth the nerves, relax the mind, and reduce tension in your muscles. Heat, also, increases blood flow; which can help with the healing process. ICE---Did the injury just happen (think: within the past few days)? If you recently hurt yourself, then icing is usually the best option. Often, when a body tissue is injured, an inflammatory process is initiated. This initial inflammation is a healthy and normal response. But, the pain associated with inflammation is not a pleasant feeling. Icing, during these early phases of healing, is a great way to control pain and accelerate recovery. Once you get out of these early stages of healing, you can switch over to heat. WHEN NOT TO HEAT---Heat tends to be our natural preference when it comes to soothing our aches and pains; but, if we apply heat during the initial phase of healing, we may make the situation worse. Heat can make the inflammatory response go into overdrive. Too much inflammation leads to more pain and swelling! A good Rule-Of-Thumb…If your injury is warm, swollen, and/or red, then avoid heat. This is time to ice! WHEN NOT TO ICE---This is a tougher question to answer in an absolute manner. Sometimes, when a muscle is really tight and in spasm, ice can make the pain worse. You may want to avoid ice during this scenario. Still confused? No major worries! 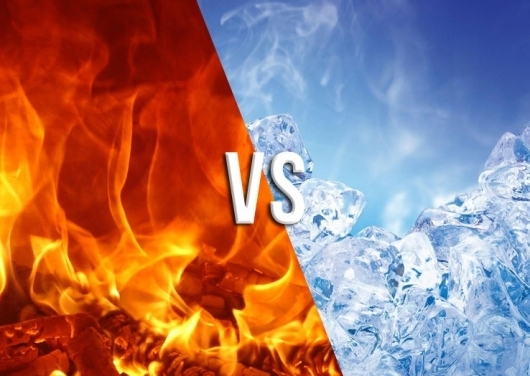 Applying heat or ice is a good way to control pain in a non-invasive manner; but, the physiological effects are minimal and short lived. If you are in doubt, do what feels best to you…just remember to minimize the use of heat on those freshly injured areas.